Bus to Sapa from Noi Bai airport? Staffs of Sapa Moments Agency often clear up and help travellers during Travelling Sapa Consultancy. For more information , Sapa Moments offers more choices for tourists to catch bus from Noi Bai Airport to Sapa conveniently and easily. When landing from Ho Chi Minh, Can Tho, Nha Trang, Da Nang, Hue, Da lat...off Noi Bai Airport . Tourists often move to center of Hanoi and continue move to Sapa on Noi Bai Lao Cai Express way is easier. When arriving to NoiBai airport , tourist just take a tram for 7 000 dong/trip , or taxi or bike taxi with 20.000 dong - otherwise book Grab or Uber to Noi Bai express Intersection( Kim Anh Intersection) - Located on the 2A highway , away NoiBai Airport about 200m, far away T1 and T2 station about 2,8km .This is the place that coach and tourist bus will pick up you to Sapa. 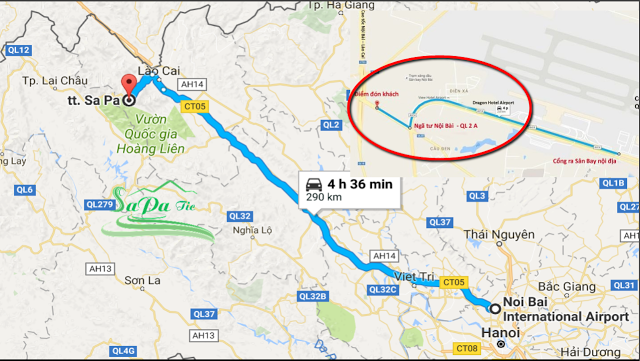 You can have a look on map for detail , the distance from Noi Bai to Sapa and the distance from Noi Bai to the place to picked up( red circle). Which bus/coach will pick up tourist from NoiBai Airport? Bus ticket fare varies from 180,000 VND to 220,000 VND /ticket. Tourist car : from 250. 000 đ -400.000đ/ticket. Limousine bus from Noi Bai to Sapa from 350.000 - 400. 000 đ / ticket. For more information, please contact us , or leave comment below.